Our practice uses the Damon system for almost all of our treatments.Damon smiles are full, natural 10-tooth smiles achieved with light biologically-sensible forces, and are specifically designed to improve the overall facial result of each patient. 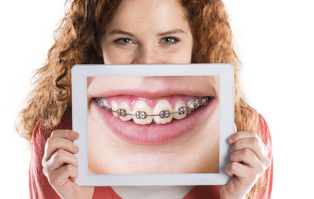 Damon is passive self-ligating braces that eliminate the need for elastics or metal “ties”. With Damon tie-less braces you can experience treatment without tightening. Clinical studies indicate that the elastomeric rings of traditional braces collect more bacteria and plaque and can lead to adverse gingival conditions.8Unlike traditional clear braces, Damon Clear does not use elastomeric rings, so your braces are easy to keep clean.